Frank Sinatra: 'A Jolly Christmas from Frank Sinatra' Saxophonist Stan Getz once said that Frank Sinatra's A Jolly Christmas was "the greatest Christmas album anybody ever made." On this holiday classic, "Ol' Blue Eyes" belts out "White Christmas," "Jingle Bells," and other popular tunes. A.B. SPELLMAN, National Endowment for the Arts: It's time to stock up on your Christmas records, and we have a great selection for your NPR Basic Jazz Record Library today. It's A Jolly Christmas from Frank Sinatra. I'm here with Murray Horwitz, and my name is A.B. Spellman. SPELLMAN: Murray, I think I get it. I understand what this has to do with Christmas, but you got to tell me, what does it have to do with jazz? MURRAY HORWITZ, American Film Institute: Ahh — A.B., I think the answer is nothing at all. SPELLMAN: To quote another Sinatra song. HORWITZ: Right. But it's December. I mean, we weren't about to put Count Basie's "April in Paris" in the library. SPELLMAN: No. People want Christmas music, to be sure. HORWITZ: Right. And this is certainly a wonderful Christmas album. HORWITZ: Now, to get personal about this for a moment, there is a jazz pedigree to this album, at least, in my memory. HORWITZ: Well, I was once directing a charity benefit, in which the great tenor saxophonist Stan Getz performed. And he left behind a shopping bag from a record store, and it fell to me to return it to him. He was very grateful, and he told me what was in the bag. HORWITZ: Yep. 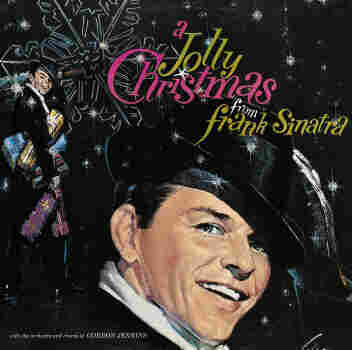 It was this CD, A Jolly Christmas from Frank Sinatra. And Stan Getz said, "You know, this is the greatest Christmas album anybody ever made." So, with that endorsement, I think we can put it into the Basic Jazz Record Library. SPELLMAN: Well, Sinatra has made some great jazz records, I believe. And he was an accolade of Billie Holiday, so that's pedigree enough for me. And this was in the 1950s, Murray, so it's understandable that it sounds a little corny. HORWITZ: Corny is the word, but A.B., it's Christmas. What are you going to say next, "Bah humbug?" I mean, there's a chorus singing throughout this album, but don't you want a chorus singing Christmas music? SPELLMAN: So, it's not jazz, but it is Frank Sinatra, and that's why we're recommending A Jolly Christmas from Frank Sinatra for your NPR Basic Jazz Record Library. It's on the Capitol label. For information about this and other stocking stuffers in the library, be sure to check out our Web site. HORWITZ: The Basic Jazz Record Library is made possible with help from the Wallace Reader's Digest Fund. SPELLMAN: For NPR Jazz, I'm A.B. Spellman. HORWITZ: And, I'm Murray Horwitz. Merry Christmas, A.B. SPELLMAN: God bless us, everyone, Murray.